What is a Shakedown Hunt? Thank you for your interest in the Woodbrook Hunt Club. We are located in Lakewood, Washington and drag hunt primarily on Joint Base Lewis-McChord by permit. Our members are a lively cross-section of age groups and experience, from lifetime members and veteran riders to proud parents leading their youngsters on ponies. 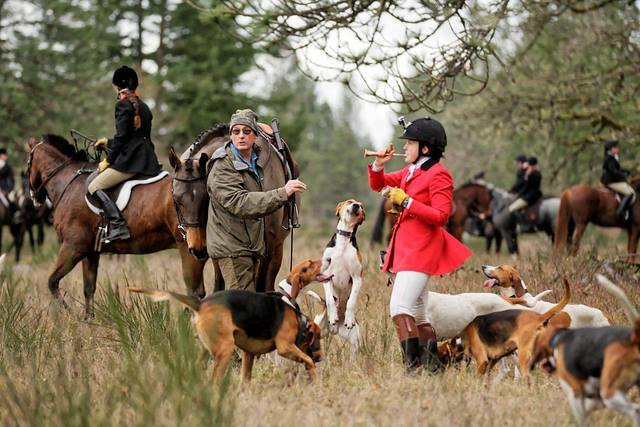 At the Woodbrook Hunt Club, we strive to maintain the traditions of riding to hounds. We sport the scarlet and black coats that you see in the old hunt prints. We keep 13 or more couple of American Foxhounds in our kennels. Hounds are hunted by our Huntsman and assisted by several Whippers-In. We also have a clubhouse for "hunt breakfasts" and other social gatherings, a formal Hunt Ball, summer hunter paces and an annual Hunter Trials Horse Show. Lorna Anderson and Simon Chapman will be leading this weekend's work party to get started on the long list of cleanup. Please check in with Lorna and Simon at the Club House at 10:00 am, we will divide to conquer chores and finish up at 2:00 pm with a breakfast to follow for the volunteers in the Club House. So please come and help if you have an hour or the entire 4 hours! Huntsman Jennifer Hansen and the hounds are home from a splendid jaunt to the Western States Joint Meet! She's shared pictures and her report just before the WHC board meeting on April 11, 2019. The joint meet was hosted by our friends at Red Rock Hounds. Jennifer attended the joint meet with Jt. Master Tami Masters and members Kate Gormally, Eric Steimert, Aubrey Roth, Patty Steimert and Sarah Glasser. If you were unable to be there on April 11 to hear about their adventure, you may enjoy her slideshow of pictures below (Photos courtesy of Nancy Stevens-Brown/Photos by Waldo​). For more information, please contact the MFHA Office at 540-955-5680.